The launching of the new Black Watch 50 represents the pinnacle in design and development in big blue water boats. The absolute leader in offshore performance and safe cruising, the Black Watch 50’s deep vee hull delivers a smooth dry ride at speed in the toughest conditions. 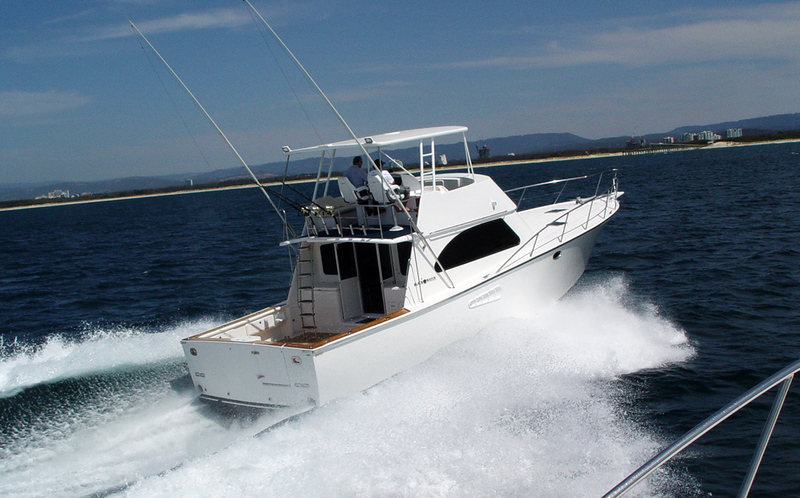 As a fishing machine its cockpit is the largest available in any boat under 60′ and its deep combings give the support needed to handle the big fish. Features are custom designed to the anglers preference and simple design inclusions convert this vast area to a comfortable cruising deck with storage, seating and cover to entertain and relax. The flybridge offers seating for eight in comfort with twin helm chairs facing a huge instrument binnacle with overhead mounts for further electronics. Entering the saloon, the warmth of cherry wood and leather combine for the best luxury finish with wide granite bench tops and drawer style refrigeration in the galley. Flat screen TV and DVD/CD sound systems add to the atmosphere for roomy onboard living. Headroom is excellent and climate control air conditioning ensures all interior cabins are comfortable day and night. The Black Watch 50 has a 3 cabin layout with 2 bathrooms providing ample luxury accommodation for the owners and their guests. The master cabin has a large island bed with side vanity and personal bathroom adjoining. The interior lining and solid construction ensure that a perfect nights sleep is standard on the Black Watch 50, and the quality furnishings and trim give you a luxury hotel room afloat. With the hull and deck being built to a survey standard, the Black Watch 50 can be pushed through the roughest conditions with ease. Using standard C12 Caterpillar diesels producing over 700HP the Black Watch 50 exceeds 30 knots at top speed and cruises comfortably at 25 knots. A 4000 litre tank gives excellent cruising range and 1000 litres of water allows all on board plenty of time at sea to cruise and fish in comfort. Also, a generator will allow more than enough reserve for all on board power needs. Perhaps the best feature of the Black Watch 50 is the ability for the owner to customise the features in the boat to personal preference. 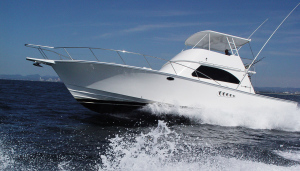 From location of rod holders and fishing features in the cockpit to saloon layout and furnishings, the proud owners can put their personal stamp on the Black Watch 50 to create the best blue water cruising boat available. Contact Black Watch to discuss the personal factory support that each Black Watch 50 owner will receive in building and using this fabulous boat.